My second day at the Space Coast Birding & Wildlife Festival started at the Salt Lake Wildlife Management Area. The weather forecast called for increasing winds in the afternoon, but the morning started off calm enough. The weather was seasonable, which was a good change from the record cold for last year’s festival. On the lake shore at the start of the day we had some good views of American Coots, Common Gallinules and a couple of Purple Gallinules. The Purple Gallinues were very active, running across the lilly pads and other vegetation like mad chickens with huge floppy feet. I’d managed to miss this bird species all of last year, so it felt nice to see them and watch their antics. Sunrise at Salt Lake WMA . The winds did start to pick up, which likely affected our attempts to see any sparrows. 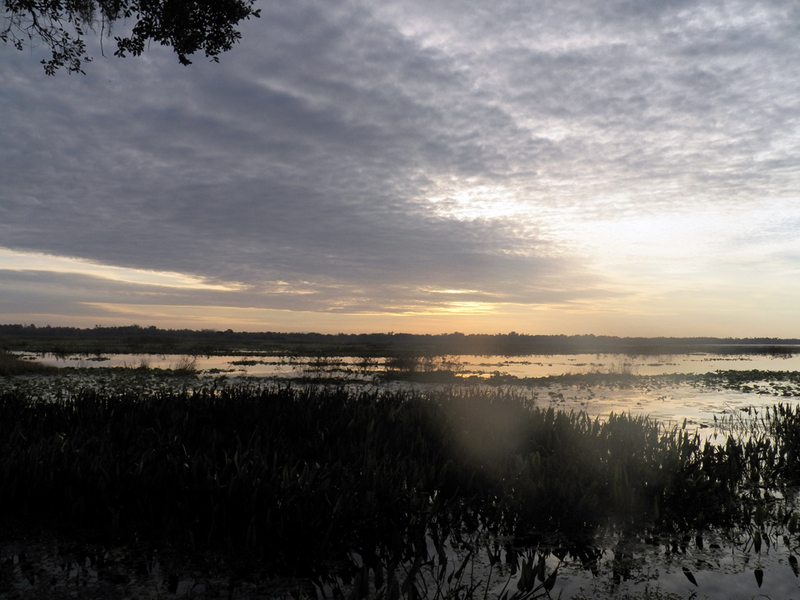 We crossed into the Seminole Ranch Conservation area, where we did see a pair of Sandhill Cranes getting their nest started. As I’ve mentioned before, spring in Florida starts in February. Many resident birds are picking nest sites and gathering material. Some are already mating and will have eggs before too long. Some of the scrub vegetation have already begun to bud and leaf out, and more of that will happen in earnest before the end of February. There was also a female Bald Eagle sitting on a large nest, her head showing up bright white against the dark branches. 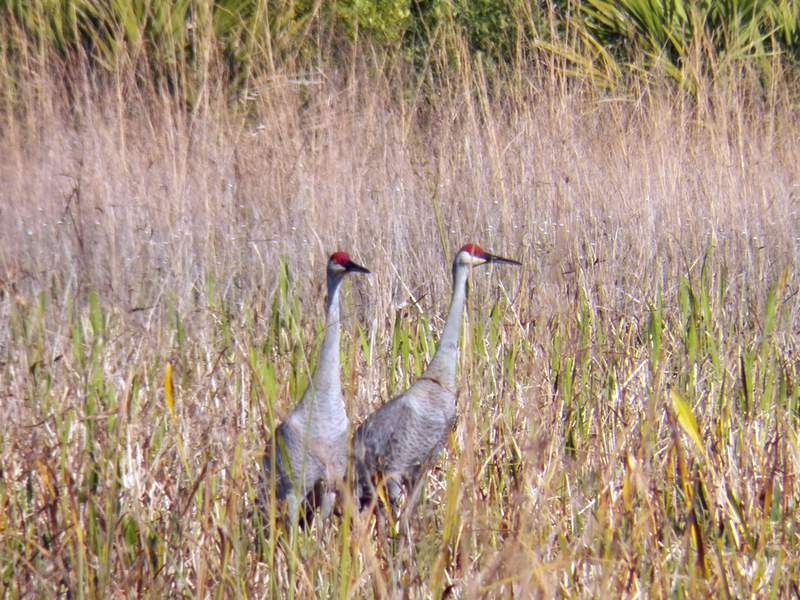 These cranes were getting their nest area started. One of our trip leaders said this is the first pair to do so in a long time in this part of the management area. I’d like to take some space here to thank Kim and Billy Bump from Mississippi for sharing some conversation and birding knowledge with me. They were so friendly and sharing, which made the trip even more worthwhile. As a closet introvert, group outings use up a lot of my energy, but people like the Bumps help me recharge and stay positive. I used the break between the Salt Lake WMA trip to go to Blackpoint Drive on the Merritt Island National Wildlife Refuge (MINWR). I last visited there at the end of December when the ducks and shorebirds were still arriving for their winter quarters. The wind was starting to pick up and the first several viewing areas had almost no wildlife visible from the road. A bit further down on the left, a scattering of American Avocets were wading, belly deep, while sweeping their upturned bills through the water. 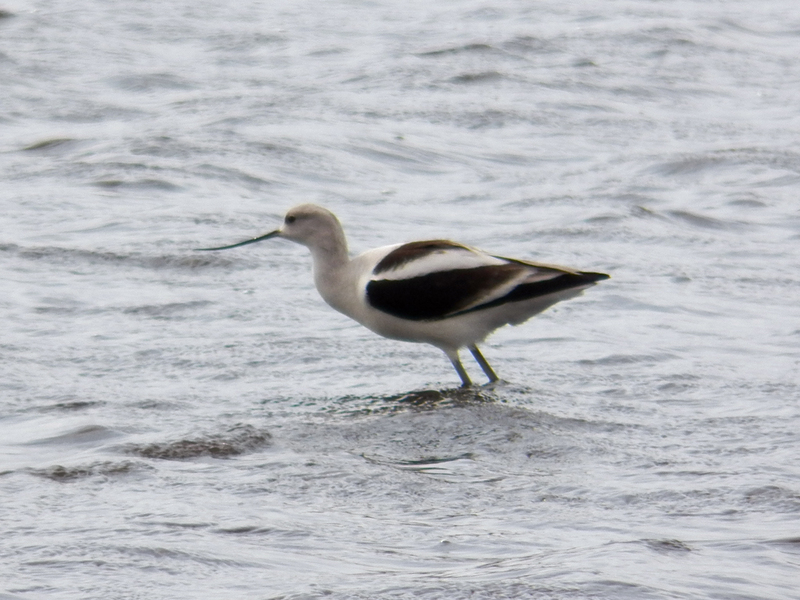 An American Avocet leaning into the wind. Beyond the areas the avocets were feeding in, on the right side of the road, larger groups of American Coots, various duck species and some other shorebirds were in higher numbers. The first group consisted of mostly coots and Northern Shovelers. 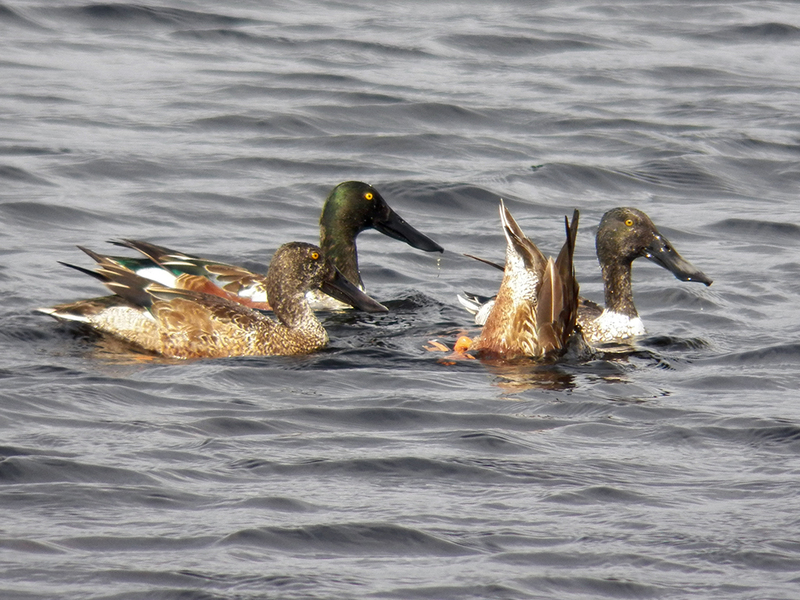 The shovelers are usually in a wide array of plumage variations, depending on the age and gender of the duck. Quite a positive group of ducks (3 up and 1 down). The next group of ducks were quite a distance across the water, but seemed to consist of some Ring-necked Ducks and Northern Pintails, trying to blend into the massive numbers of American Coots. 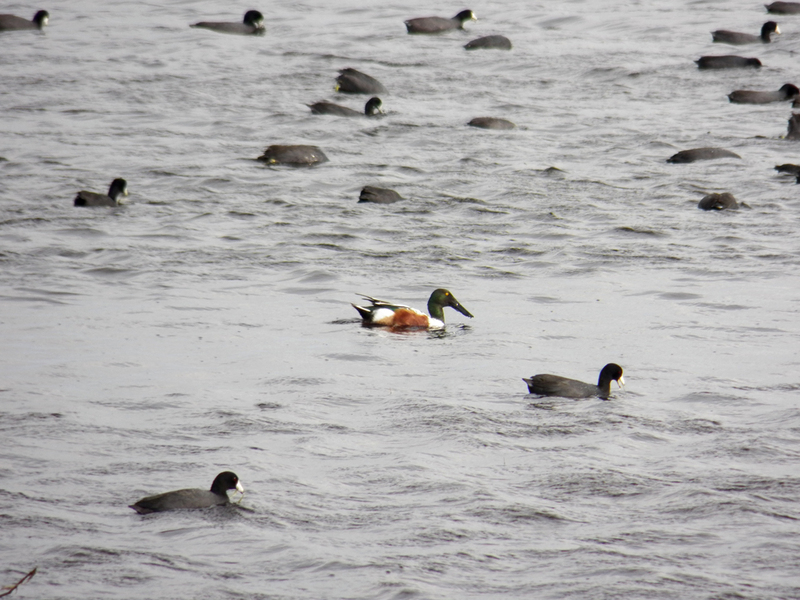 In this loosely congregated raft of birds there was a solitary male Northern Shoveler trying to blend in. Duck Witness Protection Program FAIL. I exited Blackpoint Drive after passing a few more view points with distant ducks and shorebirds. Toward the exit is one area that usually has American Wigeons, and they were toward the far end. There had been reports of at least one American-Eurasian Wigeon hybrid, but even when a Northern Harrier flushed the birds out and closer to me, I could not see if any of those particular birds were hybrids. For viewing like this a spotting scope is probably the best tool of the trade, but any decent scope is well beyond my budget right now, but I was keenly aware of my 8×42’s limitations. After a quick stop by the MINWR’s visitors’ center to see if any Painted Buntings were at the feeders (no, too windy), I stopped at Parrish Park to try to find the Long-tailed Duck that has been all the talk on the birding e-mail lists. 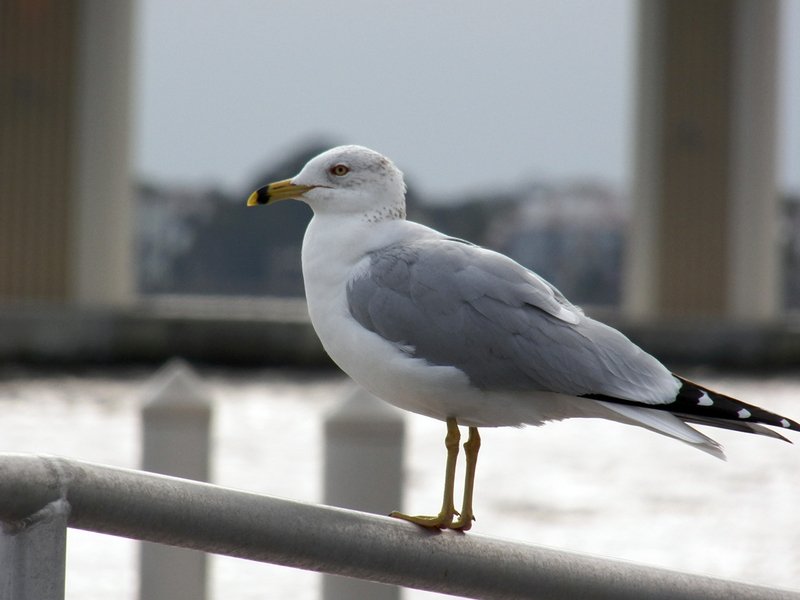 The wind at this point was really gusting, and the only birds at the park were some grounded Ring-billed Gulls and Ruddy Turnstones, staying out of the wind behind concrete walls at the boat ramp. I spent some time after that hanging around at the Festival HQ and met up with Dave Goodwin at the Florida Ornithological Union booth. Dave’s a great guy and leads the Central Florida Specialities trip each year, and he was telling me about how great of a trip it was this year. I’m going to join the FOU this year and try to make it to their meetings and get some different perspectives on birding and ornithology. It’ll be quite a step for a Lonely Birder like me, but I’m going to give it a go. When I saw there were two nighttime hikes at this year’s festival, I was very excited. The previoius night’s adventure had me anticipating more good things, especially since the second night hike was at the Enchanted Forest Sanctuary (EFS). The trip leaders were quite knowledgeable on the parks ecology and nighttime activities. We spotted and identified several animal tracks, including mice, rabbits, armadillos, tortoises and perhaps even an coyote! I learned that if you hold your flashlight in the right place, nearest your center of vision, you get eyeshine back from anything that has a tapetum lucidum, including spiders! You can see spider eyes glinting from over 50 feet away. I had heard of spider eye-shine before, but never how to see it properly. We only had a brief audio encounter with an Eastern Screech Owl, but the highlight was the brief glimpse, through a night-vision camera, of a Southern Flying Squirrel! They are small and very quick, and the trip leaders said that in many places there is a higher density and population of flying squirrels than Gray Squirrels. I saw a few other instances of eyeshine in the trees and brush, but nothing we could identify. Still, it was a beautiful night and seeing EFS at night was a real treat and a fitting end to a long but pleasant day of birding and nature. Posted on 2015 January 29 2015 June 22 by Lonely BirderPosted in BirdingTagged Enchanted Forest Sanctuary, MINWR, Parrish Park, Salt Lake WMA.